Swashbuckler, daredevil racing-car champion, Winter Olympian, gambler, smuggler, scoundrel, stud and suspected Nazi agent who died a mysterious death - this is the fascinating story of the scandalous Freddie McEvoy. 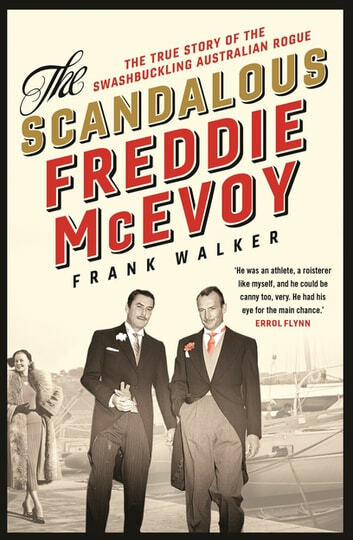 Born in Melbourne in 1907, Freddie's life took him from socialising with a young Errol Flynn in Sydney and on to the French Riviera in the heady years leading up to World War II. With his dashing good looks and charm, Freddie lived a swashbuckling life, quickly figuring out his path to easy fortune was through lonely rich women. 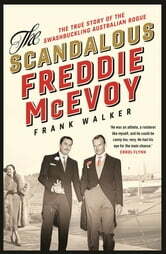 World War II didn't stop Freddie's hedonistic pursuits - he skipped enlistment for Australia and Britain to party on in Hollywood, where he renewed his friendship with the now infamous Errol Flynn. Always short of cash, Freddie smuggled guns and diamonds on his yacht between California and Mexico and was rumoured to have worked as a spy. It was a life lived large and Freddie's death in 1951 was under the most mysterious circumstances off the coast of Morocco: his body was found naked and scalped . . .
Frank Walker, bestselling author of The Tiger Man of Vietnam and Maralinga, has for the first time uncovered the complete, outrageous and incredible true story of Freddie McEvoy, Australia's daredevil lothario.